Champions Belfast Giants surrendered their 100% record in this season's Elite League by falling to a 3-2 defeat away to Sheffield Steelers. Playing less than 24 hours after a 3-2 success at Hull, Steve Thornton's men took an early lead through their captain Adam Keefe. Jason Hewitt and Cullen Eddy scored to put Sheffield 2-1 up. Robby Sandrock got the only goal of the second period with Colton Fretter netting the winner early in the third. Coach Steve Thornton will be disappointed with the result in Sheffield, especially as he had a full strength line-up for the first time this season. They started well with Keefe's first goal of the league campaign putting them in front on 2:21 with Darryl Lloyd and Evan Cheverie credited with the assists. The advantage was lost, though, as Hewitt levelled matters at 5:17. Defenceman Eddy gave the home side a 2-1 lead on a powerplay before the end of the first period. Sandrock tied the game at 24:44 but Colton Fretter snapped up the winner on 43:52. The Giants piled on the pressure, outshooting the Steelers overall 51-33, but they couldn't beat goalie Frank Doyle for a third time. They came close when Cheverie hit the post during a late powerplay. 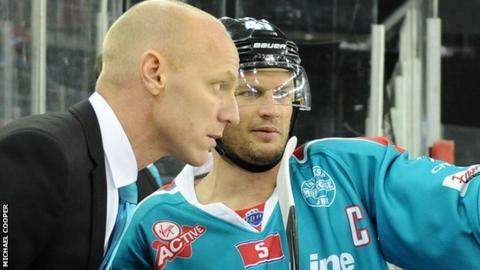 The Giants are next in action on Saturday, 27 September when they host Coventry Blaze in a league fixture. The following day they are at home to Fife Flyers in a match which counts in the league and Challenge Cup.